WASHINGTON (Dec. 8, 2016) — The George Washington University (GW) formally launched the GW Cancer Center with a ribbon-cutting and grand opening celebration the evening of Wednesday, Dec. 7. The celebration took place on the eighth floor of the Science and Engineering Hall, where the new GW Cancer Center offices and lab spaces are located. The event signals a historic commitment from GW in the fight against cancer and the commitment to finding a cure. 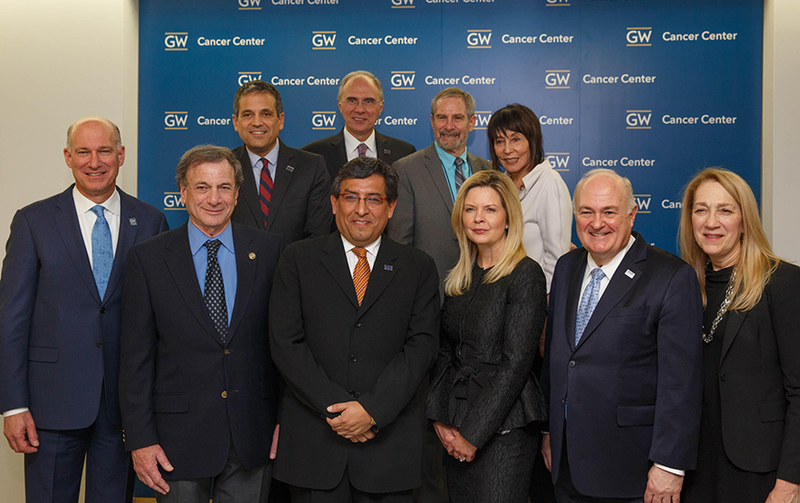 Speakers at the grand opening celebration included Steven S. Knapp, Ph.D., president of GW, Douglas R. Lowy, M.D., acting director of the National Cancer Institute, and Ellen V. Sigal, Ph.D., chairperson and founder of Friends of Cancer Research. In attendance were community leaders, cancer physicians and researchers, alumni, students, and friends. To learn more about the GW Cancer Center, please visit gwcancercenter.org. Media: For photos of the event or for more information, please contact Lisa Anderson at lisama2@gwu.edu or 202-994-3121.